The text for this evening falls in an awkward place in the middle of one of the most famous narratives from the Gospel of John. We have before us a side conversation, and a cryptic one at that, as John is often wont to do. Here Jesus offers John’s version of a most elemental metaphor for Christian faith and witness: harvest. But as is often the case in the fourth Gospel, Jesus is here not just to communicate, but to disrupt our assumptions, to jar our categories, and to enable us to reconsider God’s work in the world and our place in it. In other words, Jesus is concerned with nothing more than the revelation of the very nature of God, in himself and his encounters with people, particularly those who are seeking some answers, some hope, and something that cannot perish, spoil, or fade. Jesus in this engagement with his disciples is concerned that they have a change of vision, a change of priorities, and a transformation of the way in which they engage with and perceive the needs of the people around them. But when you and I approach this text we do not come to it blindly, as if we are hearing for the first time. Neither do we come to it in a vacuum, as if what is really going on here has no bearing on this response that Jesus has to those closest to him. And what I want to explore tonight are a number of ways that we have been misshaped to read this text and the larger story that it is a part of, and more importantly how we have thought about our place in the world as the redemptive presence of God in a deeply wounded world. Before I try to unpack the ways in which we have been shaped to misread this text by centuries of presumption and problematic theological commitments, I want to just explore briefly the way that Christian thinkers through history have thought about this woman and her story in which we find this enigmatic teaching of Jesus about the harvest. First I wish for us to hear the text, with the side conversation with Jesus amongst his disciples temporarily removed from view. I want us to listen particularly closely to the places where we have been formed to “fill in the gaps” or to articulate a supposed backstory of what is occurring here. What we will find is that this actually reveals much more about us and the communities under whose influence we have been taught this story than it does about this Samaritan woman. Now when Jesus learned that the Pharisees had heard, “Jesus is making and baptizing more disciples than John” —although it was not Jesus himself but his disciples who baptized— he left Judea and started back to Galilee. But he had to go through Samaria. So he came to a Samaritan city called Sychar, near the plot of ground that Jacob had given to his son Joseph. Jacob’s well was there, and Jesus, tired out by his journey, was sitting by the well. It was about noon. Is this the way that you have heard this text explored? For me, it most certainly is not! 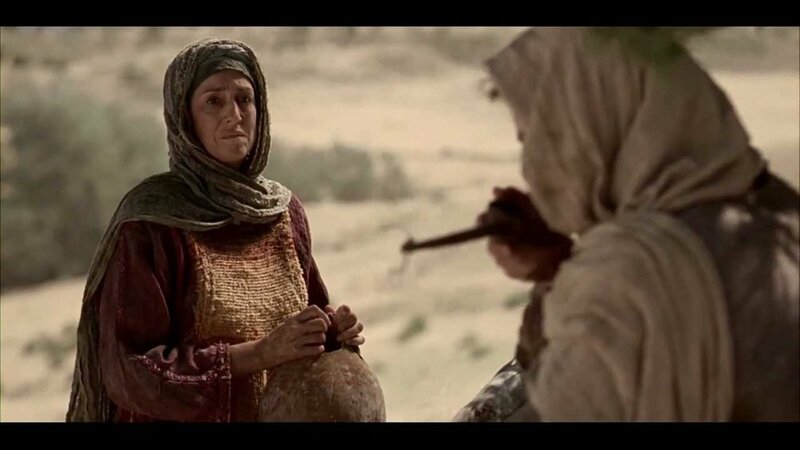 A Samaritan woman, with a deeply problematic life of immorality and social exclusion, has come for water in the middle of the day because she is such a pariah that she must come alone. It is this serial adulterer who has had five husbands and now is simply living with a man, who happens upon Jesus. And it is there, confronted by the revelation of her sinful life, the full weight of her guilt and shame, feeling completely exposed by this stranger that knows all her deepest secrets, that she comes to believe that this is who Jesus is. There is no mention of why she came in the middle of the day, there is no suggestion that she is alone, and there is no suggestion that she interprets Jesus’ insights into her story as provoking guilt, shame, or even repentance! But instead of trying to describe the ways in which this history of interpretation takes such a downward spiral beginning in the writings of the early Reformers, from which we take our own theological and interpretive heritage, I want to try to get at the underlying issue that directs us to these kinds of readings. And the core of these issues is this: Particularly in the traditions that are in the lineage of the Protestant Reformation (of which theologically Churches of Christ most certainly are), the primary focus and primary problem in need of resolution in theological constructions of salvation is as follows: forgiveness for guilt incurred by sin committed by the person. In other words, for people in the Protestant line of interpretation around this text, we must first find the guilty agent in order that the work of salvation can properly begin. The real problem however is this: Salvation as merely the forgiveness of guilt is insufficient. There are so many elements of our lives in need of salvation that have absolutely nothing to do with forgiveness. It is for this reason that I would like to propose that we think about the Samaritan woman in this story, as well as ourselves and those around us, not as wicked, but as wounded. This is not a suggestion that we should replace wicked with wounded, for there are undoubtedly persons and powers and communities that perpetrate unspeakable evils in the world and against people everyday. Instead I want to suggest that we must expand our language and our categories to think about the way in which all persons are wounded persons. Think back to the Samaritan woman of our text. The early Reformers painted her as a sarcastic, belittling, sexually promiscuous, flagrant sinner who responds to Jesus with thinly veiled contempt...until Jesus shakes her with the revelation of her utter wickedness. They want us to understand that only after demonstrating to this woman how awful she was could she begin to be prepared to receive how good and how redemptive the person talking to her could be. And this kind of pattern, of exposing our depravity as a mechanism of bringing about conversion, is so deeply engrained in our faith and even in the very systems that govern our society. It could be argued that the entire American project is rooted in this malformative vision initiated by Augustine and transmitted to us through the pens and pulpits of people like John Calvin and Martin Luther. America is after all, the only nation in the world in which the fundamental commitments and categories of the Protestant Reformation are connected, sometimes inseparably, to the powers of the State. But I want to propose that Jesus does not see in the Samaritan woman, or us for that matter, someone who is fundamentally wicked and in need of forgiveness to stave off an almost certain eternal damnation, but instead as someone who is deeply and profoundly wounded and misshaped by the Powers of Sin and Death. We are not therefore considered to be objects of God’s wrath, but recipients of the responsive, redemptive compassion of the Great Physician. This is not to in any way minimize the realities and destructive force of the sin in our own lives. It is true that sometimes the most harmful wounds a person experiences are in fact self-inflicted. But it is to recognize that at the end of the day, when we really reflect on our lives in all of their complexity, all of their pain, and all of the potentiality, that the majority of the wounds that most deeply shape who we are, for good or for bad, are not wounds that were self-inflicted but were wounds that were done to us. It’s unlikely that she was divorced five times, each for committing adultery. No man would dare marry a convicted adulteress with neither fortune nor fame. That she was a serial divorcée is also unlikely. She would’ve needed the repeated help of a male advocate to do so. Further, we have no evidence that anyone in the ancient world, man or woman, divorced five times. … It is more likely that her five marriages and current arrangement were the result of unfortunate events that took the lives of several of her husbands. Perhaps one or two of them divorced her, or maybe she initiated divorce in one case. As for her current situation, maybe she had no dowry and thus no formal marriage, meaning her status was similar to a concubine’s. Perhaps the man she was currently with was old and needed care, but his children didn’t want to share their inheritance with her, so he gave her no dowry document. Perhaps he was already married, making her his second wife. While the ancient Jewish culture allowed it, such an arrangement went against Jesus’ definition of marriage as a union between one man and one woman (Matt. 19:4-6). It makes sense, then, that Jesus would say that she wasn’t married. Scripture doesn’t tell us why she had five husbands, but exploring first-century realities helps us imagine how her life might have unfolded (Cohick 68, 69). In other words, when Jesus “calls her out” what is in fact happening here is that Jesus is extending an offer of welcome and embrace, of satisfaction and security, and of stability and permanence -- for “those who drink of the water that [he] give[s] to them will never be thirsty. The water that [he] will give will become in them a spring of water gushing up to eternal life.” -- to someone whose wounds are deep, long, and irreparable. He is not offering her mere forgiveness despite her wickedness, Jesus is extending to her an opportunity to receive from the Great Physician himself, the healing she so desperately wants and needs. This cryptic teaching can now be seen perhaps in a clearer light. We are not sent out into the world to reveal to it its inherent wickedness and depravity in order that it might panic or be so moved by the overwhelming nature of guilt and shame. Instead, we are sent out into the world as representatives of the Great Physician whose power is that he enables us to properly diagnose the ways in which we have been wounded and offer us life, God’s life, in the here and now, leading towards our healing and redemption. Jesus is teaching us here that the thing that sustains him -- and by extension the same thing that can sustain our own lives -- is to be about the healing and redemptive work of God in the world. Jesus is calling us to recognize that when we locate our shared woundedness with our sisters and brothers in the world, and when we commit to lives that bring healing and redemption, we too find healing. This is the experience of the Samaritan woman! She found in her woundedness a place where the work of God offered her healing and she couldn’t keep this to herself. She began to reap a harvest among her own people that God had been sowing for a long time. And in the same way we are sent into the fields, the places where we find the universal wounded community called humanity, to bring in a harvest of healing and wholeness and redemption that we did not plant but that we will have opportunity to both receive and participate. Cohick, Lynn H. “The Real Woman at the Well: We Know Her as an Adulterer and Divorcée: Her Community Would Have Known Otherwise.” Christianity Today 59, no. 8 (October 2015): 66–69. Farmer, Craig S. “Changing Images of the Samaritan Woman in Early Reformed Commentaries on John.” Church History 65, no. 3 (September 1996): 365–375. Maccini, Robert Gordon. “A Reassessment of the Woman at the Well in John 4 in Light of the Samaritan Context.” Journal for the Study of the New Testament 53 (March 1994): 35–46.